The first CD my family ever owned was The Way It Is. I loved every track on that disc and I still do. I was in sixth grade then and Bruce and his music has been a constant in my life to present day. I find myself constantly rediscovering his songs when I hear new ‘live’ versions of them. Not many artists can do that. 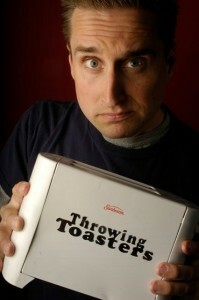 Throwing Toasters is my comedy music act. I’ve played at clubs and colleges all over the United States, played a sold out show at the Tokyo Dome in Japan and opened for “Weird Al” Yankovic in 2007. I figured most people would think it strange that a comedy musician is covering Bruce tune so I chose one I felt I could have a little fun with. My thanks to Bruce for his years of inspiration.